This video is part of the appearance, “NetApp Presents at Tech Field Day Extra at Cisco Live 2017“. 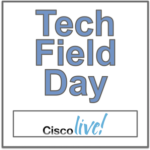 It was recorded as part of Tech Field Day Extra at Cisco Live US 2017 at 16:00 - 17:00 on June 28, 2017. Jeremiah Dooley, Senior Manager, NGDC at NetApp, gives the delegates an architectural review of the FlexPod SF. This marks the first architectural change since the FlexPod solution was introduced over seven years ago. This still runs the same ElementOS, so existing integrations remain intact. He reviews how this works with Cisco’s line of Catalyst switches, and how it will integrate overall into your datacenter.